Sigrid Rausing is the editor (and owner) of Granta. Her grandfather built the Tetrapak global packaging empire. An heir to the resulting fortune, Rausing’s first memory is the smell and alienation of being driven in a chauffeured car, aged four. Mayhem is a layered, emotionally conflicted yet ultimately loving memoir that explores addiction from the perspective of family members. Her brother Hans met his wife Eva, an American socialite, in rehab. They sobered up, married, had four children. On New Year’s Eve 1999, they unwittingly edged into relapse with a champagne toast to the new millennium. Their return to full-fledged addiction was discovered when Eva was caught with crack in her handbag at an American embassy cocktail party. For the next 12 years, the family’s private hell (including Sigrid taking custody of the couple’s children) was paralleled in tabloid headlines, culminating in Eva’s two-months-dead body being found beneath a pile of mattresses and televisions in the squalid bedroom of their £7.5 million mansion. In making sense of her experience, Rausing is also trying to solve the riddle of addiction, which she traces to an essential ‘emotional deficiency’. But she doesn’t simplify it – on the contrary, her careful, coruscating reflections draw on psychoanalytic theory, the infamous marshmallow test, Joan Didion, Edie Sedgwick and Andy Warhol, and the Fall of Eden. Fascinatingly, it’s also a reflection on privilege, ‘what it means and what it doesn’t mean’. She meditates on their 1960s upbringing, and its ‘fine line between neglect and freedom’, while asserting that her brother was loved. 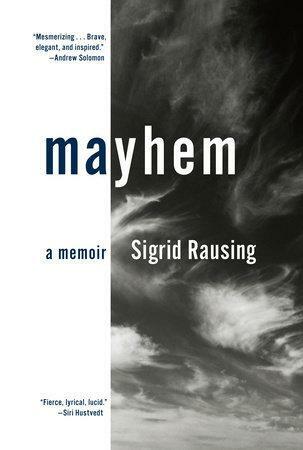 Endorsed by cerebral literary heavyweights like Siri Hustvedt and Andrew Solomon, Mayhem is about more than one life or one family: it’s a complex diagnosis of addiction itself.